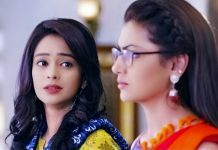 She doesn’t want to come between Mauli and Kunal. She explains herself that she can’t do this sin of ruining Mauli’s happy perfect marriage. Nandini limits her feelings. She cries out when she feels failing her goals. She wants to be loyal to her friend. She thinks if she falls for Kunal, Mauli’s relationship with Kunal will end, which isn’t right. Nandini doesn’t want to stain their friendship by her selfish desires. She hates herself for falling in love with Kunal.